PARIS (AP) – Hundreds of protesters from France’s yellow vest movement marched Saturday for a 17th straight weekend in Paris and other cities to maintain pressure on the government to reverse policies they see as favouring the rich. Women, some carrying pink balloons, led the calm and orderly Paris march, advocating for equal rights and equal pay a day after International Women’s Day. A water cannon contained several hundred protesters who remained on the Champs-Elysees and wanted to leave the security perimeter. The march, which began at the Arc de Triomphe, at the top of the famed avenue, looped through both sides of the Seine River before ending at the top of Luxembourg Gardens on the Left Bank. 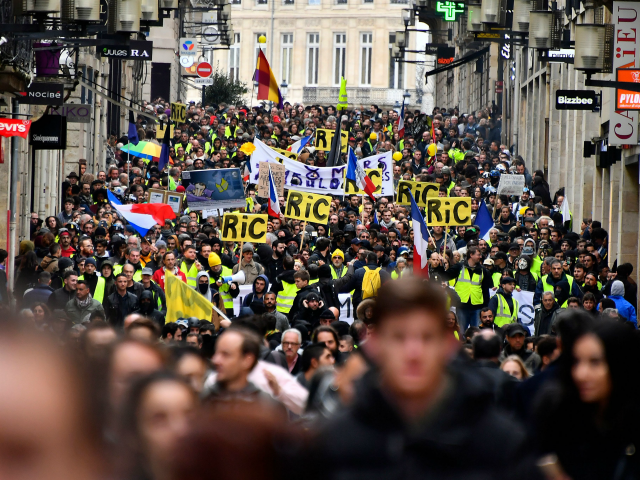 Marches were also held in numerous cities around France, including Bordeaux, which has a strong contingent of yellow vest protesters, Lille, and Le Puy-en-Velay, in south-central France, where hundreds joined from other regions. Many shopkeepers there boarded up their businesses in advance to protect their wares. The numbers of protesters on the streets has diminished over the weeks, and polls have shown support by the French fading due to violence and damage that has marked some protests.